Want the look and feel of a real fire without having to collect wood or clean up the residue and ash left behind from logs? Using gas logs is a solution for you. Gas Log Sets are perfect for the outdoors with a realistic look and providing the heat that you would get from a real fire. These are perfect any time of year, from summer nights to chilly fall and winter evenings. Best of all, they are easy to use and leave no mess behind. 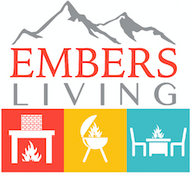 Check out the selection from Embers Living today.